As Khyber Pakhtunkhwa is expected to receive huge funds from the federal divisible pool next fiscal year, farmers hope that the provincial government will provide sufficient funds and start a rigorous programme for the uplift of agriculture. Agriculture has traditionally received insufficient funds ranging from one to two per cent of the provincial annual development plan despite the fact that it accounts for over 20 per cent of provincial gross domestic product, provides employment to 45 per cent of the total labour force and about 80 per cent of the population is dependent on it for survival. A high official in the agriculture department said he was happy with the size of agricultural development budget, but he did not reveal the exact allocation. Agriculture was allocated Rs800 million in outgoing fiscal year’s core provincial ADP of Rs32 billion. This year it is likely to be around Rs1 billion out of an expected Rs45 billion ADP. “The government will ensure both quantitative and qualitative expansion of different sub-sectors of agriculture such as increasing per acre yield, land development, bringing more land under cultivation and developing the livestock sector and horticulture and so on,” he said. The total outlay of the KP’s budget for 2010-11 is expected to be around Rs300 billion as compared to Rs214 billion last year. After about 80 per cent increase in its federal receipts due to the historic NFC award that increased its share, KP will receive about Rs160 billion this fiscal as compared to Rs90 billion in the outgoing fiscal. It will also receive Rs25 billion as net hydro profits. So its net receipts will come to about Rs200bn that would further increase in coming years. While there will be no shortage of finances, what is required is a commitment on the part of the government departments to develop agriculture through efficient management and utilisation of available resources. Ihsanullah Khan, president of the KP Chamber of Agriculture, said high prices of the various agricultural inputs, power and oil have made it extremely difficult for farmers to do farming. Farmers need cheap inputs more than any thing else. If not, agriculture would suffer tremendously in the province. KP has low per acre yield in wheat. The provision of quality seed is a requisite for improving the yield. “The budget should also have some allocation for developing seeds locally. Until that is done, high yielding seed varieties must be imported. Also, easy and timely availability of seeds and other inputs should also be arranged through improved distribution network. Abiana is double than in Punjab, it should be reduced,” he added. The KP’s agriculture policy is targeting food security and poverty alleviation. But it is hardly possible with the existing low per acre yield, meagre acreage, inability of farmers to modernise farming. KP has not been able to fully exploit its huge water potential due to insufficient budgetary allocations, shortage of water reservoirs and lack of physical infrastructure. KP and the tribal belt have 25 million acres of land. Only 6.7 million acres of it is cultivable. But irrigated land is only 2.27MA while around 4.4MA still await irrigation facility. KP is a food deficient province. 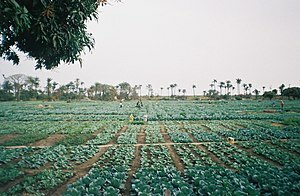 To grow more food, it needs to bring more land under cultivation. But cultivable area forms just thirty percent of the total cultivable land in KP. “Model Farm Services Centres (MFSC) are serving the farmers well. But financial constraints and poor membership numbers have restricted their efficacy. The government should give at least Rs10 million to each MFSC for purchase of inputs and machinery. More MFSCs would have to be opened besides increasing their members,” said a farmer. KP usually gets meagre share in agriculture credit. The government should allocate Rs2-3 billion for interest free loans for farmers and SRSP’s services should be utilised for distribution of loan facility.